Holiday Housewalk~ ya’ll come on in! ya’ll come on in~~ i’m so tickled you’re here! this is the second year Jen has hosted this wonderful tour and this year the homes are absolutely incredible! i am totally running with the big dogs! i am so inspired by the homes and the women who have created them! this year’s tour was even featured on Pottery Barn’s Blog! oh my goodness! thank you so much for including me jen!!! if you’re dropping by after visiting Kimberly’s beautiful home at serendipity refined, welcome~~ c’mon in! dan & i and the girls, along with brinkley, thank you for dropping by! we wish each of you a very merry christmas!! the next stop on the tour is Laura’s lovely home at finding home–you’re in for a real treat!! & please drop by Jen’s and start the tour from the very beginning…you won’t want to miss any of it!! Kris Pare - Love all your beautiful Christmas touches! Adore your signs–but the Narnia one is fantastic. Merry Christmas to you and your family and that sweet pup! Jennifer @ Town and Country Living - Love your home and Christmas decor! So far, this is my fave stop on the tour. Your photography is fabulous! Traci - ok. i think i have to agree with jennifer at town and country living. yours in my fave home on the tour. can i throw all my stuff away and start new. wow. so beautiful paige. simple, colorful, true!!! love the framed print by the nativity and all your vintage ornaments. i need more!! thanks for sharing. i think boone and brinkley were two of the cutest parts to the tour too. dana - Such a lovely visit at your home! And just as special is the fact that you really “live” there…with 4 kids and a dog…you cook, craft, make messes and do life in that beautiful home! Thanks for sharing and inspiring! Have a Blessed Christmas! Kim @ Plumberry Pie - Paige, everything is just right. So beautifully done. I love it!! So glad to have found you through this tour. I will definitely be checking back in again. Laura @ Finding Home - Everything is so lovely, I especially love that Reindeer painting and your porch – but Brinkley (love the name!) is definitely the star – such a sweet face! Thanks for inviting us in! Linda Evans - AWESOME !!!!!!!!!!!!!!!!!! Renee Ford - It so pretty, Ms. Paige!!!!! I think I’d like to come live with you. Great pictures, as always. Much love. Merry Christmas!!! Kimberly - Your home ticks all my boxes. Quite lovely. The center hall staircase with its glorious banister and line of photographs, the industrial touches with early American pieces, the clean white palette all work wonderfully well together. Thank you for sharing your home with us. Merry Christmas to you and yours. Jennifer Rizzo - Paige, thank you so much for opening your doors and sharing your home! As usual its lovely!!! Thank you for being a part of the tour!! LIsa - Your house looks beautiful! When I saw your first photo of the golden retriever with O Holy Night in the background I knew I would love the rest! Thank you for sharing. Stacey - Gorgeous! I love all your bottle brush trees. The quotes and inspirational messages that you have around the house are wonderful too. Merry Christmas! Amy Avery - Oh Paige, your home, I have seen it before decorated for Christmas, but this year, it just sparkles even more! Mr.Brinkley is such a wonderful host to take us on the tour of y’all’s home. Love his heart! Your captures of your home are amazing! Magazine worthy for sure! I am partial, but your home is my favorite on the tour. It is elegant and stylish, and classic, and calm, and inviting, and really a “Home” of the hearts of each of you and Dan and the girls. You are a blessing Paige! Thank you! I hope that you have a blessed and relaxing weekend! YOU’VE OUTDONE YOURSELF…I’M NOT JUST SAYING THIS..YOUR HOUSE IS ROCKING THE CHRISTMAS SPIRIT!!! michele m fry - Love your house and love your trees!! Merry Christmas and a very happy and blessed new year!! just so you and I’m so grateful for all you do for others! Jeanne - Hi Paige! I adore your home all decorated for Christmas. Love the bright light throughout your house. Everything looks beautiful…thanks for sharing! Lisa @ Fern Creek Cottage - Everything looks so very lovely nd festive! Thank you so much for sharing your home with us! I have my tree in a galvanized tub too. It’s a fun look. I really LOVE the red deer pillow. Could you please share where you got it from? MorningT - Paige~ you’ve managed to blow me away again this year. Your home AND your photos are just stunning. I’m going to have to go back through and see everything again. Thanks for sharing your gorgeous home with us again this year and Merry Christmas!! susan@avintagefarmwife - Paige-Your home is just lovely! Your little vignettes are gorgeous, and you have me seriously thinking about white paint. Most of all I love that you ended with scripture. What a sweet heart! Shannon - You never disappoint!!! I love the calming simple Christmas you have created, the bright vintage ornaments add the perfect amount of fun to your home. Thanks for inviting us all in, Merry Christmas! Dee - I LOVE your house. I always do. Everything about it, every detail. It’s one of my favorites. You did a great job. What a wonderful and warm feeling your home must give off to your family and people who visit. I feel it through the computuer so I can’t even imagine being in person. Amy - I love your home and love your Christmas decorations! Wishing you a Merry Christmas! Thank you for sharing your daily life with us all. Anne - Your home is beautiful! I LOVE your simplistic Christmas decor! bethanie - Its beautiful Paige!! So peaceful and homey!! Meg - I have gone through this whole tour and felt compelled to comment on only your home. All the other homes are beautiful and you would expect nothing less but there is something about the freshness with which you have done your Christmas decor. Although we don’t share the same style your home looks amazing and I really enjoyed the chance to see it. Happy Holidays! Cathy - What a lovely home and delightful Holiday decor. You have inspired me to haul out my collection of vintage ornaments..
Pam Duffel - I agree with all of the above! I will become a follower today! Thank you so much! Shelley @ Calypso in the Country - Your home is so peaceful and I love the splashes of color. I also love your golden retriever! We have a female golden who is almost a year old. Love those dogs! Emily - Your home is absolutely stunning. I love the bottle brush trees and empty frames. I love the vignettes you’ve created all over the house. They’re like little stories. And the photography…breathtaking. Thank you for all of the inspiration! LLH Designs - Love the simplicity combined with the sparkle and shine. Beautiful, Paige. I bet you had fun decorating, photographing and sharing! xoxo! tb - “You had me at Brinkley”….. But to comment on the rest I will say Its beautiful! U truly have it all. A rescued golden and an eye like no other artist photographer and designer! Love love love!! love and is just lovely. Julie Schaal - This all blessed me. Such loveliness! jodi - Paige your home is so lovely, so warm and inviting. Your decor is gorgeous, yet simple…..Perfect! I wish you and your family from our family a very merry christmas! 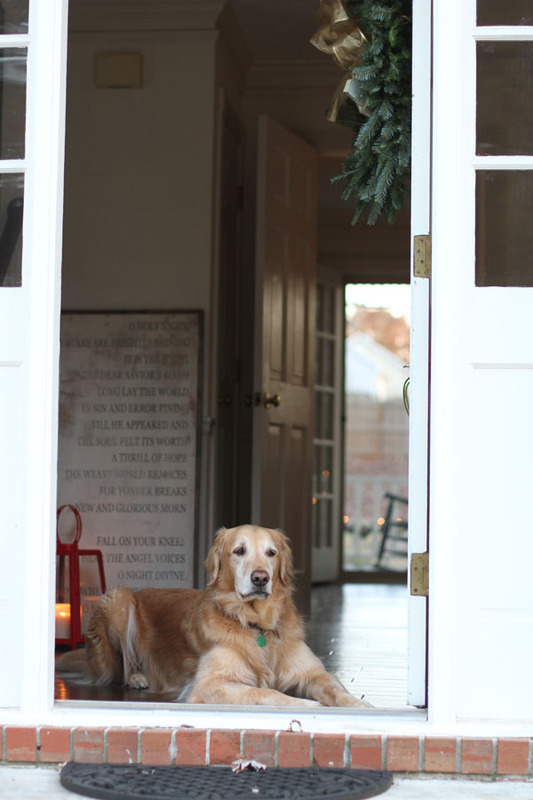 Kelly @ Eclectically Vintage - Brinkley is the best decoration in your fabulous home! Love your antlers, giant ornament filled dough bowl and pops of red. Janet Lawson - Your home is beautiful and I love your photography..
Dear Lillie - Oh my goodness! Every image is so stunning. Your home looks gorgeous. I LOVE your porch! isabella - Beyond lovely. So refreshing and serene. I would love sources for so many of the lovelies pictured. I must have that deer print….too sweet. So happy to have found you. amber peters - Your home is so lovely! I love your minimalism – it’s a breath of fresh air. Everything looks so pretty! Flower Patch Farmgirl - So perfectly cozy and bright, pretty lady! I love it. Especially the reindeer print. And the antlers. And that fab nativity! December blessings to you. Thanks too for your Noonday posts, hoping to place an order soon. Dawn @ Inspired Living - This home tour is amazing. I love neutral and have such a hard time adding touches of color. You somehow maintained both in your home. I’m in love with your decor. Pinning. Jen@thecottagenest - Gorgeous and festive Paige! I always love seeing your home decked out for the holiday. patty - your home is just delightful, but the pictures of your home… wow. love those mercury balls and bottle brush trees…i have small collections of my own, but yours… love. Anne @ DesignDreamsbyAnne - What beautiful style you have! And such a great eye! If I could manage to become 1/10th of the photographer you are, I would be thrilled. Thank you for the tour! Jeannine - Just getting around to catching up now! Nov/Dec were crazy! So relaxing to tour your oh-so-beautiful home! Your humility and eye for beauty always lift my soul. He shines through you indeed.